While I was shedless for a year, working out of a cramped (uninspiring) garage, I made a start on a bowl from a Mallee (?) burl. The bowl sort of progressed, then was put aside, had a bit more done, then set aside again over a 6 month period. I found it in the garage the other day, and took it to join the lathe in the shed. With some more turning, quite a bit of sanding, then polishing with friction polishes from Ubeaut, it finally got finished. 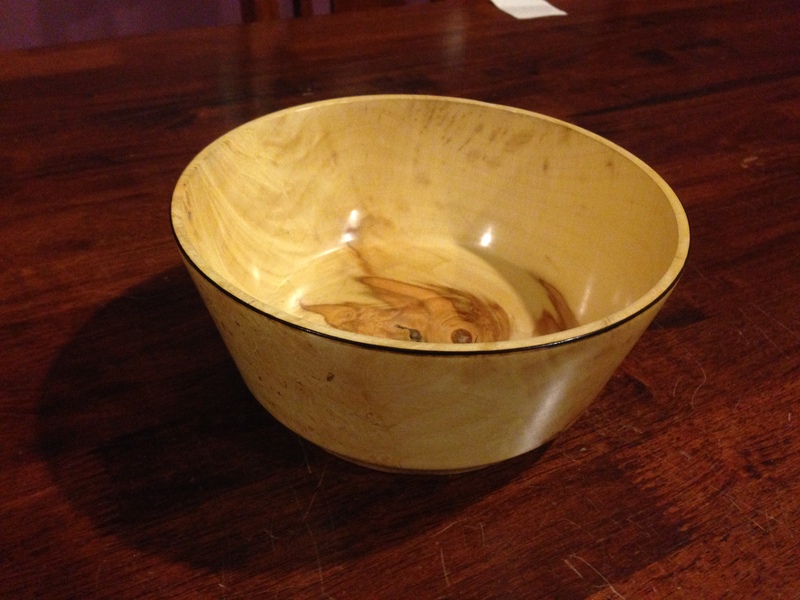 The base may look heavy, but other than the rim, the whole bowl is a pretty consistent thickness. It is 180mm in diameter, 80mm high, and has a 4mm wall thickness. Finished by sanding to 400 grit using the Skilton sander, then polished, first with Ubeaut EEE Ultrashine, then Ubeaut Glow to give it a rich gloss. The inaugural timber of-the-month from Brad’s Burls is a piece of Brown Mallee Burl, which looks very interesting in it’s as-cut state, and stunning when given a quick sand and oil (let alone any serious finishing). There is always a lot of tortured, gnarly grain in a burl which always leads to some very striking patterns. The edge of the burl has a much lighter shade which will make for an awesome natural-edged object. 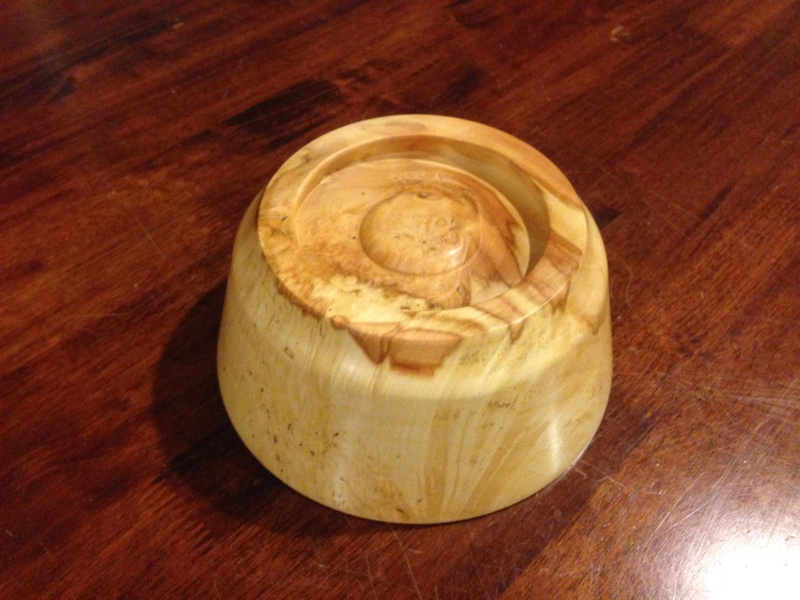 In this case, I am considering turning it into a dual lidded box, with the edge of the burl actually meeting at the centreline. This piece was approximately 400mm x 400mm x 10mm, costing $33. Sanding very quickly revealed more of the character in the timber, and even at the lower grits a sheen was quickly produced. I continued sanding up to 1200 grit, using a ROS (random orbital sander). There was a surprisingly little amount of dust produced, and no particular smell to note. Next, a light oil was applied (Triton in this case), which really revealed the rich, warm mid brown/orange tone. The centre area of the burl is also worth noting, and shows a very interesting character. Getting in very close, and the texture becomes quite fascinating, with a real 3D effect to the surface – this still looks and feels smooth to the touch, but I spent a long time just looking at the macrostructure that is revealed here. (Macrostructure – a term I’ve nicked from metallurgy, which is used to describe the general crystalline structure of a metal and the distribution of impurities seen on a polished or etched surface by either the naked eye or under low magnification of less than x10. Seemed quite appropriate here as well).